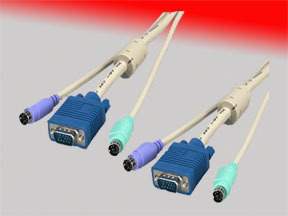 These KVM cables feature keyboard, monitor, and mouse connections combined into one cable. The cable is easy to connect due to the color coding on the connectors. The VGA portion of the cable provides crisp, clean resolution for your PC’s monitor. KVM Cables ensures you maintain excellent signal integrity throughout each connection. The monitor connectors come with thumb screws to aid in easy installation.